Mazda has seen fleet sales grow by 84% in the first nine months (April to December) of its 2013/14 financial year, with the help of six dedicated fleet specialist dealers. The Mazda6 featuring Skyactiv technology went on sale early in 2013 and helped the manufacturer secure a 60% growth in fleet sales in 2013, up from 6,447 units to 10,325 units. Mazda has a six-strong fleet specialist dealer network which is helping to lead fleet growth. Holdcroft Mazda in Stoke-on-Trent was appointed an FSD early in 2013 and initially experienced a three-month trebling of fleet sales. Since then fleet demand has increased by up to 15% quarter-by-quarter. Group fleet sales director Malcolm Pearson said: "Following an initial surge in business we have experienced steady growth. “Initial fleet success has been with Mazda6 and CX-5 and we anticipate that the launch of all-new Mazda3 will deliver further growth. It was a good business decision to become a FSD." Holdcroft Mazda says fleet demand has been fuelled by the dealership targeting local business, which in turn have been receptive to buying Mazda's key fleet models or opting for a leasing arrangement through Mazda Contract Hire. The RRG Group, which operates Mazda franchises in Manchester, Rochdale and Stockport, also became a FSD in 2013 and has seen Mazda demand increase more than 40% year-on-year. Group fleet general manager Andy Houston, who is based in Manchester, said: "Mazda6 and CX-5 have both been big players as we see rising demand from the local business community. We anticipate that demand to grow significantly in 2014 with the all-new Mazda3 now on sale." 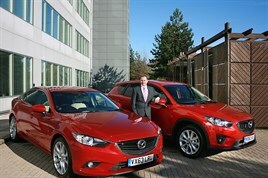 The group has appointed Richard Wilson as Mazda business centre manager with responsibility for winning corporate sales. Houston said: "We are talking to businesses about models that are competitive in the market in terms of tax efficiency and whole life costs. Many local businesses only look at transaction price, but when we explain whole life costs and the tax position of Mazda models they understand the benefits available. Much of our role is about delivering advice."